Blood Screenings: How much is too much to prevent Hepatitis C? Global Health Africa blogger, Udo Obiechefu, discusses the impact of Hepatitis C in Africa and the crucial role that blood screening can play in HCV prevention. With the recent introduction of Solvaldi and Olysio as high efficacy treatment options for newly acquired cases of the hepatitis C virus (HCV), now is an important time to visit the hepatitis C landscape on the African continent. The global prevalence of hepatitis C is currently estimated at 3%.Sub-Saharan Africa is estimated to have hepatitis C prevalence between 0-14 percent. There is a dearth of data available on HCV in Africa and this lack of information is due to low reporting rates and inefficient surveillance. The cost of care associated with medications is high with little use for those chronically infected with the virus. Although the recent advent of both Solvaldi and Olysio are promising (Solvaldi exhibits a 90% cure rate for those recently infected), there is still an almost insurmountable barrier to care. A twelve-week treatment of Solvaldi costs roughly $84,000. Olysio comes in at a slightly more economical rate of $66,000 per twelve-week course. With these figures in mind, one may see the task of addressing HCV in economically depressed regions as near impossible. Although treatment therapies for those living and recently infected on the African continent may be difficult, it is important to take note of the efforts that can be made in prevention of the virus. 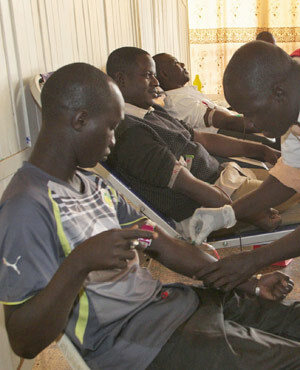 Stronger measures must be made in blood screening efforts since blood transfusions have proven to be the primary method of infection on the African continent. We have to look no further than the high HCV rate (17%) among those with sickle cell anemia in Africa. Hladik et al. investigated HCV prevalence utilizing a set of 2592 plasma donations in Central Uganda. Over 4% of specimens proved positive for HCV. Screening for hepatitis C can be a costly investment, with an estimated cost of $782 per screening. More must be done to close the financial gap to make HCV screening for blood donations in Africa a regularity, as opposed to a scientific interest for potential journal submissions. $782 is not worth a lifetime of chronic illness, especially with treatment options limited and costs high.